This budget education storage unit can be used in pre-school to higher education establishments for a variety of different applications. The units are finished in Beech and available for a free UK mainland delivery usually within 10 days from order. 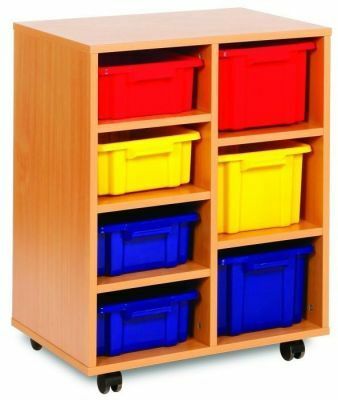 Education storage that is part of our budget education storage range. Can be used for a variety of applications and is mounted on easy glide smooth castors for easy mobility across carpeted areas. Available in a choice of 4 different tray colour options and there are 3 different combinations to choose from per unit. Delivered for free to any UK mainland location within 2 weeks from order.